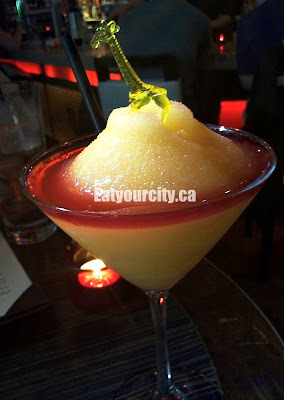 Eat Your City: Milestone's Restaurant Edmonton, AB - great service and tasty food - next Girl's night out! After a long day or running errands around town, we stop off to grab a bite to eat before meeting up with friends for a movie at South Edmonton Commons. We wanted a place to grab a couple of appetizers and some drinks. We passed over Joey's and Lazia, to give Milestones a whirl. Dark woods, colourful lighting in reds and blues, and funky colored glass decorative pieces livened the packed and happening place. We luckily got a bar table without too much of a wait - the restaurant seating was packed and wait list was about an hour long. A surprisingly varied gluten free menu is offered (more than just salad). Service was totally unexpected - friendly, thoughtful, efficient and checked on us numerous times without being overbearing - while she checked on 5+other tables she had under her watchful eye. Noise level in the bar was similar to noise in the restaurant level - must be all the drinks specials tonight! After seeing the bartender just pump out glass after glass of bellini's with something bright at the top, we couldn't resist and ordered Milestone's original bellinis as well. Cool smooth slush of white rum, peach liqueur, sparkling white wine and Boone's sangria. Very sweet, and quite light. Whimsical touch with the little plastic animals... watched the inner child of those that ordered a bellini around the room play with their zoo animal - galloping, tossing, flying, swimming or sinking in the bellini "quick sand". 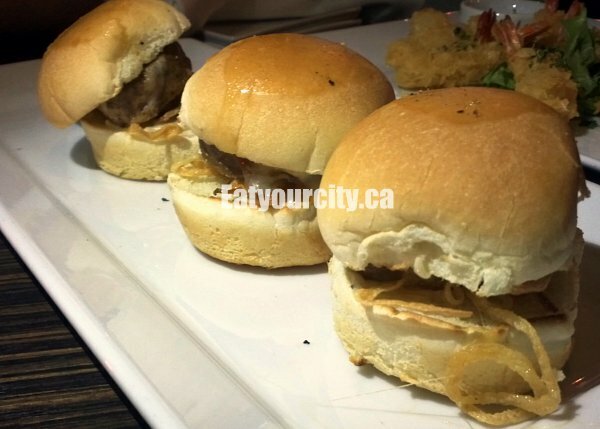 The Kobe beef classic style sliders came out a few minutes after we got our drinks. These 3 mini charbroiled hamburgers were topped with some melted mozza, crispy onion straws in a super soft slightly sweet bun. Its served with a sesame and mustard based sauce - give it a stir, otherwise you only dunk your burger into a pool of fragrant sesame oil.. but its nicer with a bit of the bite from the mustard. Sooo tasty!! Picture doesn't do it justice. Next time totally trying the large version!! Our next apply was the Crispy honey phyllo shrimp. 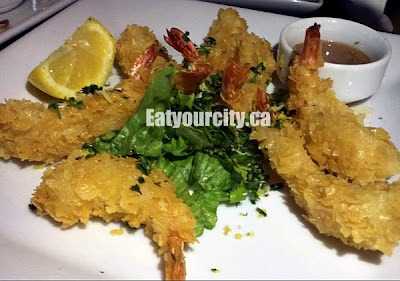 Crispy phyllo flakes encrust these large shrimp... and the "honey" part is provided by the honey chipotle glaze dipping sauce - I preferred the shrimp alone, my boyfriend enjoyed the glaze which tasted like slightly diluted honey with a smash of fresh chills in it. We also shared an entree to save room for dessert. Unfortunately, the Portabello mushroom chicken entree we chose to share was humongous! I'm going to have no room for dessert.. nooooo! This was only 1/2 the order!! LOL! the original order has 2 seared chicken breasts, portabello mushrooms sautéed with fresh basil, cloves of roasted garlic and a rich, yet not too heavy reduced Reggiano cream, with a side of crisp tender steamed green beans and baby carrots. The capellini pasta is tossed in a bit of butter for those that like it light - I just swirled it into the yummy mushroom sauce. Perfect for sharing - the kitchen thoughtfully split the entree and plated it on 2 dishes for us. It easily filled up the 2 of us... so much so, we tried our best but totally didn't have room for dessert! Tasty drinks and food with fantastic service - great for dinners and girl's night out. 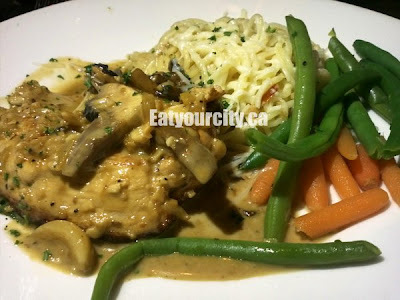 Come with a big appetite if you plan on finishing the portabello mushroom chicken entree!